I finished reading this book in 2 days straight. That is how gripping and thrilling it is! Just my kind of novel - crime, thriller with some emotions and a lot of twists and turns! I am a sucker for such books, and Eleventh Hour turned out to be just like that! I wonder why I haven't read other books yet! 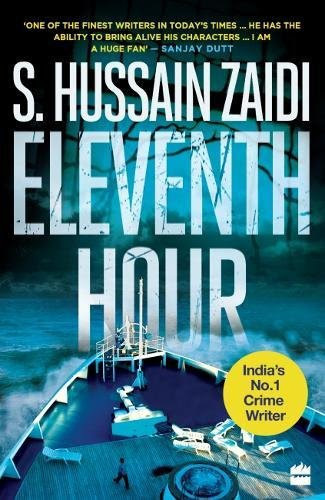 Situated years after the 9/11 Mumbai attacks that nor me, nor any other Mumbaikar will ever forget...the book and the characters take you through on-the-edge ride towards another attack in the waiting. I won't tell a lot about the story, you can read the summary below, but Vikrant's chemistry with his mentor Misra and the character Daniel are just awesome! I could imagine the story as a movie in my mind, infact this so could be a Bollywood movie (if done well). Can't wait to read Mr.Zaidi's previous books. A must read! New Delhi, 2017. It is nine years since the 26/11 terror attacks in Mumbai and the wounds have still not healed. Especially not for Superintendent of Police Vikrant Singh, who ends up landing a slap on the High Commissioner of Pakistan’s face when he meets him at an event. Meanwhile, in Bhopal, five members of the Indian Mujahideen, arrested by Vikrant, break out of the Central Jail. Vikrant, suspended for the diplomatic disaster, is unofficially asked to assist the team tracking the escaped terrorists. In another part of the country, a retired tycoon, a heartbroken ex-soldier and a young woman dealing with demons of her own embark on a journey of self-discovery aboard a cruise liner from Mumbai to Lakshadweep. Fate, however, has other plans, and the cruise liner is hijacked. Racy and riveting, this is Hussain Zaidi at his best. S. Hussain Zaidi is a veteran of investigative, crime and terror reporting. His previous books include Black Friday, Mafia Queens of Mumbai, Dongri to Dubai, Byculla to Bangkok and Mumbai Avengers, some of which have been adapted into Bollywood films. Hussain Zaidi lives with his family in Mumbai. When you get married at an early age!